Here it is next to the Bandai DBZ SBC Son Gohan. Again I apologize if I'm posting in the wrong area.. Thank you! The SS Trunks from the SBC Movie 7 3-pack has been a grail of mine to find and I finally got one. I knew it lacked accessories and needed stickers, so I decided to buy the cheapest brand new SBC or Irwin Future Trunks I could find, so I did that and both arrived on the same day. What impresses me most about the SS one is that his skintone is so nice and healthy looking. It doesn't show well on my computer screen, but the Irwin Future Trunks has a rather sickly, gray skintone to his face and chest in comparison. I haven't yet decided what I am going to do. Since I have to open this Irwin Trunks anyway, I thought about repainting the eyes and eyebrows on it, and boil and popping (or heating with a hair dryer) the hair off the SS figure and putting it on the brand new body. No, not to sell, but to display in my collection better. The problem the SS figure has is the previous owner super glued the boots onto the legs and the figure doesn't stand well because of it. It also has chipped paint on the hand. I may attempt to heat the legs and see if I can get the original body to stand better by adjusting the legs and then rapidly cooling them with ice water. The boots are perfectly inserted into the legs, so they did a nice job on the gluing, but as anyone who owns this figure knows--the figure doesn't stand if you have the boots inserted perfectly. You have to do them at a slight angle and not push them all the way in. 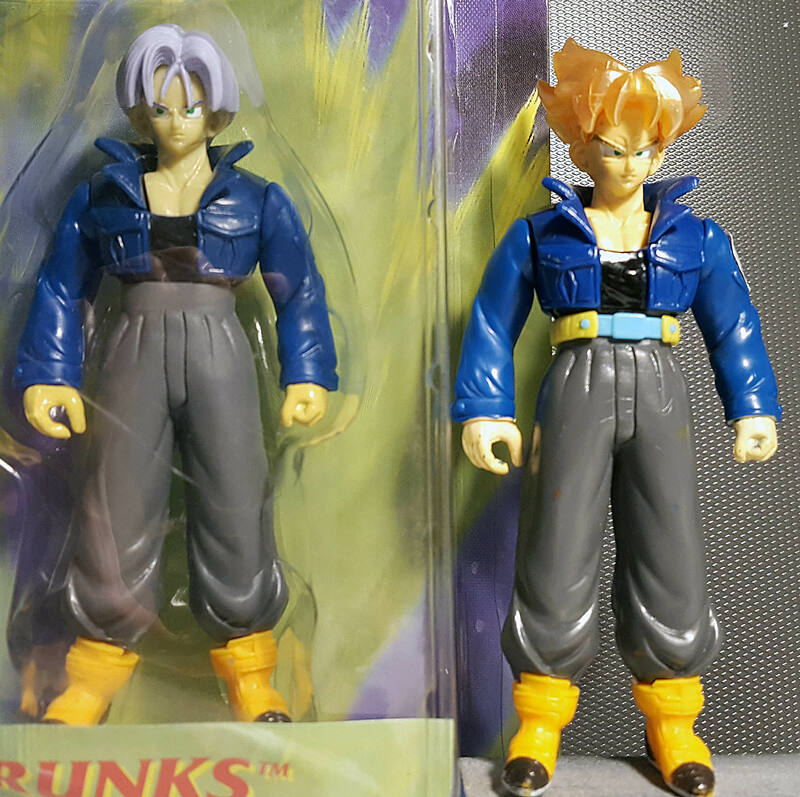 Also, I'm going to have to analyze this in person, but is the face sculpt on SS Trunks different?? It appears he has a furrowed brow above his eyebrows, making him look angrier! I'll have to look when I get home! If that's true, then I'm just going to add the accessories and stickers to this guy! Whatever I end up doing, I'm pretty thrilled to own this. Does anyone else own this Trunks? Does anyone own the Goku and Vegeta? Can you provide side-by-side comparison photos of them with their non-rare, easy to find counterparts? I don’t have have many still, but the ones I still have, I love. 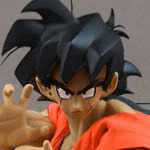 The GT Goten that I customized and the Mathlete Gohan who came with him are a couple of winners. I also remember enjoying Piccolo, Fat Buu, Ultimate Gohan, Perfect Goku, and SS4 Goku. I think Irwin/Jakks redid every SBC except Baby, Super Baby Vegeta (form 1&2) Great Ape Baby Vegeta, and the aforementioned GT Gohan/Goten. And they never made a Broly that was as big as a tank, but IF labs/Giant Ape picked up that slack.